Download a PDF copy of this infographic HERE. Our personal narrative – the story we tell about our lives – has a lot of power to improve our resilience. Everyone faces challenges along life’s path. 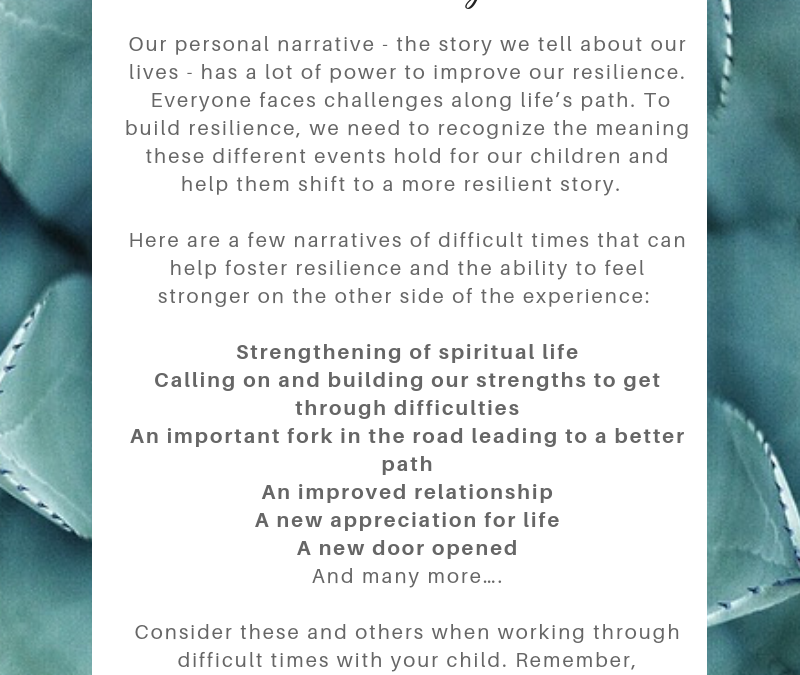 To build resilience, we need to recognize the meaning these different events hold for our child and help them shift to a more resilient story. Consider these and others when working through difficult times with your child. Remember, resilience isn’t “not feeling the sad, mad, frustrated, hurt feelings.” These feelings are important and should be felt. Resilience is about believing that sunny days are waiting on the other side of the rain. One way that we can build resilience in our children is to help them to put their challenges in perspective. You can do this by, for example, zooming out in time on the problem. This encourages your child to see challenges as small moments in time, that won’t be that relevant to their lives later on. Ask your child about the problem they are encountering, then ask them if it will still be an issue for them in a week, a month, a year, or many years into the future. Listen in with Dr. Jen to learn more! Getting outdoors does so much to improve our wellbeing! When kids get outdoors, they have an environment in which they can naturally take calculated risks. Risky play means that our child encounters something they feel a little bit afraid of, but the challenge is within their capacity to overcome. Taking on and overcoming this challenge allows them to experience the related feelings of satisfaction and accomplishment. 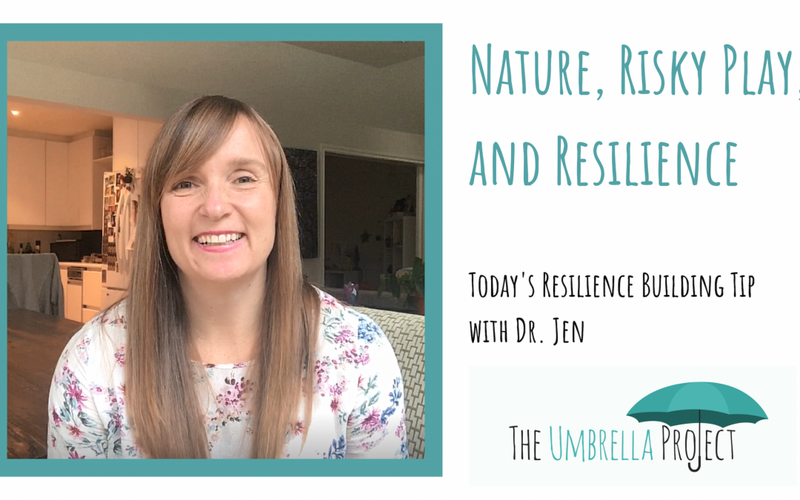 Listen in with Dr. Jen below or on our Youtube channel here. 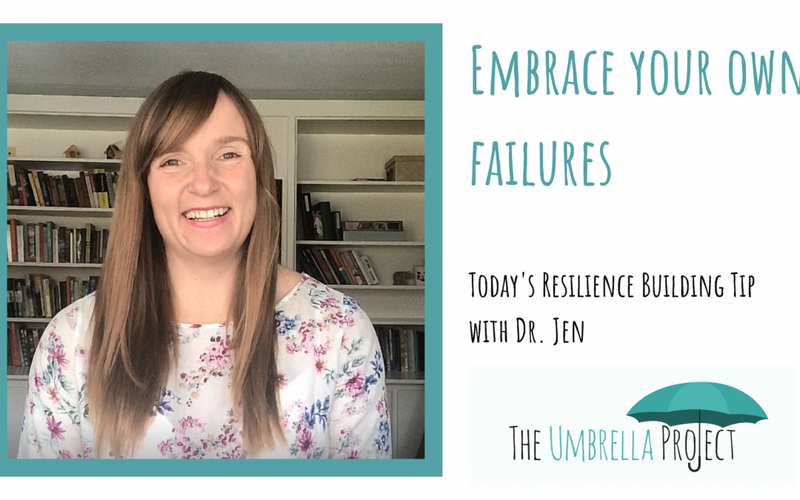 To help your child get through failure and rebound from these failures stronger than ever, embrace your own experiences with failure. As adults, we often try to cover up our failures or not talk about them. It might feel that doing so would threaten our jobs and relationships. However, embracing our own mistakes and teaching our kids that mistakes are okay will help them be less anxious about failure and more likely to learn from own mistakes. Listen in to learn more with Dr. Jen below. This week, teach thoughtful problem solving to your child to boost their resilience skills. Good problem solving skills build our resilience and boost our confidence in getting through difficulties. Start by having your child come up with a list of at least five (5) or six (6) possible responses to the problem. Help them select their two options and create a pros and cons list for those two (2) options. Select the best option and have your child give it a try. Evaluate how the response went and, if needed, select another option to try. 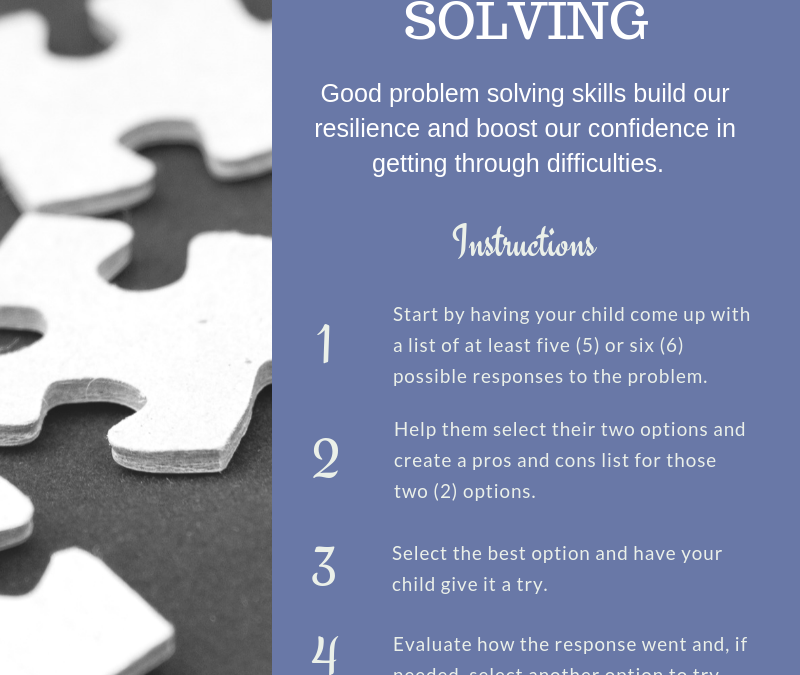 This approach will help your child with many of the umbrella skills – improving their ability to think flexibly, come up with multiple solutions to a problem, act for themselves, re-evaluate their efforts and ultimately bounce back better from challenging times. DOWNLOAD YOUR PDF COPY OF THIS INFOGRAPHIC HERE. Children are sponges and will pick up their primary parent’s way of thinking about the world. What does that mean? It means that if you are are an optimist, your kids will be, too. If you tend to put a negative frame on your life events, your children will also learn to interpret the world this way. Why does this matter? An optimistic frame has been shown to better support resilience and your child’s hope for their future, helping them bounce back from tough times. 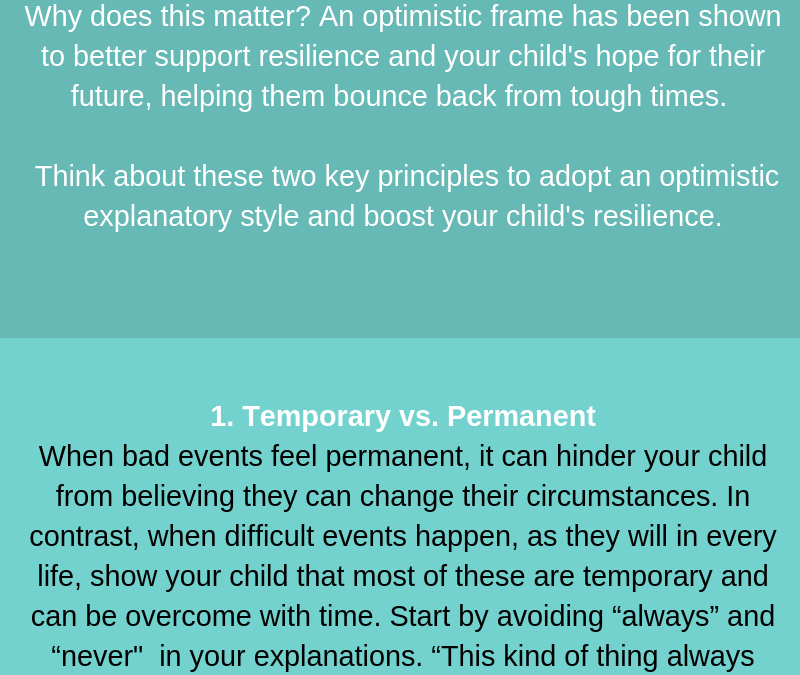 Think about these two key principles to adopt an optimistic explanatory style and boost your child’s resilience. When bad events feel permanent, it can hinder your child from believing they can change their circumstances. In contrast, when difficult events happen, as they will in every life, show your child that most of these are temporary and can be overcome with time. Start by avoiding “always” and “never” in your explanations. “This kind of thing always happens to me” feels pretty permanent. The more temporary your child sees challenging times to be, the more they will be optimistic for the future. It’s easy to see patterns in life and group them all together, but this style of explanation can leave us feeling pessimistic about our chances to make change. Try to be specific about the issues you face. For example, after a lazy day with nothing crossed off the to-do list, try saying “I was feeling lazy today” instead of “I am lazy”. The latter is more specific to the situation at hand and leaves room for tomorrow to be different while the former seems unchangeable.